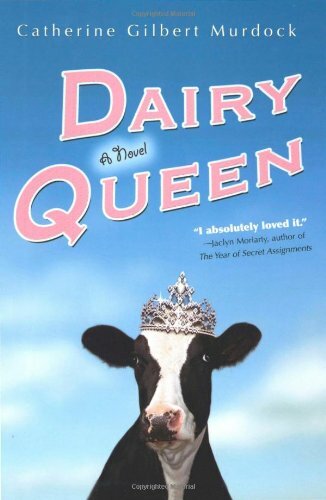 One thing that I remember about seeing a review of Dairy Queen was that I liked the cover with the blue sky and the cow with a crown. It looked funny. The other thing that I now remember is one of the other bloggers reviewing Dairy Queen and saying how wrong the cover was for the book. Oh, yeah. The cover belongs to a book full of madcap girl adventures, perhaps of a farm girl who tries out for a beauty pageant and hilarity ensues. Well, that is not, um, this book. In fact, the title is actually kind of wrong for the book too. Just off the top of my head, I’d name it What’s Not Said. Oh, or picking from the chapter titles, maybe Heifers Don’t Play Football. D.J. has gotten stuck with running the family dairy farm when her father is incapacitated. Her grades have slipped and she is exhausted, but the Schwenks work hard and that is what she is determined to do. One day a football player from the town’s opposing team is sent to the farm to help out, and he makes her look at how she falls in line with everyone’s expectations. After an initial conflict, he comes back to work and D.J. trains him for the new football season. Along the way, she finds a friend and learns how to talk  a skill she hasn’t picked up from her uncommunicative family. She also discovers that her best friend is gay, and finds that she doesn’t know how to deal with that revelation. As Brian trains with her, D.J. discovers her own hidden talents and finds ways to bring out in her family what’s not said (see how I worked the new title in there). Dairy Queen had some light humor to it, but is not the book you would expect from the cover  or the title for that matter. I enjoyed the farm setting, having grown up in a rural area myself. In fact, in numbers and demographics, it could have been my high school. Wisconsin isn’t the only place that has cows you know. I thought the message was good, if sometimes overdone. Communicating is good, not communicating is bad. Following a predetermined path is bad, making your own decisions is good. Not hard-hitting stuff here, but it was well presented with realistic and interesting characters. None of whom  as far as I can tell  ever put a tiara on a cow. I was just looking at the cover of DQ this morning, thinking how great it is. The whimsical cover probably pulls in lots of buyers. Interesting that it doesn't match up to the book. Edge Of The Forest: Now With MotherReader! The 48 Hour Book Challenge: GO! Is It Good To Shave Your Eyebrows? No. Never. What To Do With Gooney Bird?